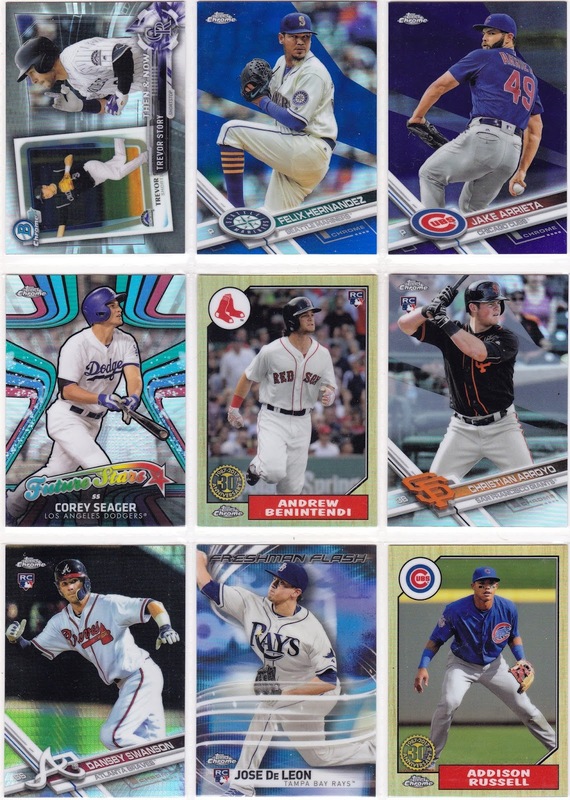 Home » 2017 Topps Chrome , Aaron Judge , Andrew Benintendi , Cody Bellinger , Review , Rookie Card , Topps » 2017 Topps Chrome Review - Boom or Bust for Collectors? 2017 Topps Chrome Review - Boom or Bust for Collectors? With the meteoric rise of Aaron Judge and Cody Bellinger, it was of little surprise that collectors bum rushed stores nationwide to pick up boxes of 2017 Topps Chrome Baseball. 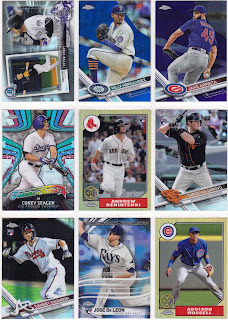 Whether was in search of the first Topps rookie this season of the second-generation Dodgers upstart Bellinger, or an insert of the 2017 Home Run Derby champ, this year’s Topps Chrome literally flew off of the shelves. Collectors almost immediately went online post-release either sharing photos of the joys of their finds, or desperate shots of empty shelves at nationwide retailers. Topps struck gold with this release due to the timing of the success of the two power-hitting rookies, as well as the anticipation of Bellinger’s first official Topps major league card. Many looked to jump on the heels of their ascent with the anticipation of turning a quick profit or snagging a rare parallel for their personal collections. With prices easily eclipsing those of suggested retail, collectors hoped for a huge payout knowing they might come up short of the big “hit” that they’re searching for. With each of the 24 packs in the box yielding only four cards, there was a feeling of urgency going through each quartet, hoping that a coveted variation of the aforementioned East and West coast supernovas emerged. In between the anticipation of the big names also sat a host of refractors, a rainbow of colored parallels, glossy 1987 Topps themed inserts to keep the excitement level high while perusing the contents of the box. After the dust settled, we had good reason to shout, “All Rise,” as an Aaron Judge rookie was among the dividends, as well as a chrome refractor of fellow Rookie of the Year candidate, Andrew Benintendi. 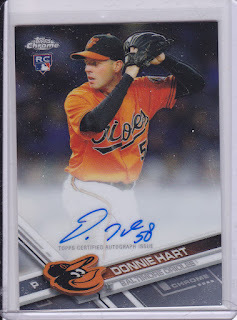 Unfortunately, Bellinger’s debut issue was absent, as well as a high end autograph, with the box serving up two rookie autographs of Donnie Hart and Eddie Gamboa. There are a bevy of reasons why baseball card collectors should be excited about 2017 Topps Chrome; the design is outstanding, the parallels are worth chasing, and the narrative of the young stars will have fans coming back to this product as the pennant race heats up. For the few left on the fence deciding whether to take the plunge into 2017 Topps Chrome, it’s an exciting dive that collectors hopefully know the risk of the waters they’re jumping into.